What is the best rifle bipod? There are a few points you need to keep in mind when looking at a stand. For us, what we like to keep in mind include ease of use, how much effort is needed to deploy it, effectiveness in various environments in stabilising a weapon and overall build quality. Of course a big part of the best rifle bipod for you will also depend on your specific intended use, e.g. tactical use, hunting, target shooting/practise. 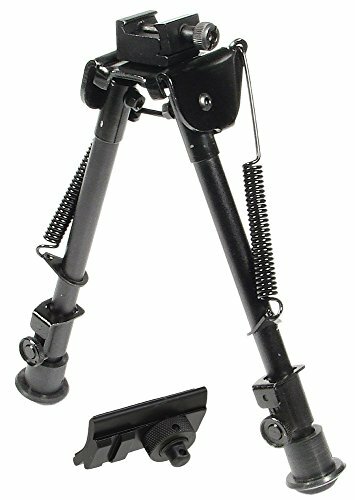 Before jumping into which one we think is the best rifle bipod, it might be worth also having a look at how to use one properly. This video shows practically how to use it effectively when shooting. Below we look at 5 options that we really like and believe are the best rifle bipod options. Of course this is just our opinion. We know some folks will have their own opinion on what the ideal product is. If you want to share your thoughts with us, please feel free to post in the comments section below. We would love to hear from you! The first stand we looked at was the Ohuhu 6-inch to 9-inch Adjustable Handy Spring Return Sniper Hunting Tactical. It’s heavy-duty and made of hardened aluminum and steel with an anodized non-rusting finish. This is definitely a plus considering intense outdoor use. Despite its durability, it is surprisingly light-weight. Thanks to an easy-to-assemble body there’s no need to lug a bulky one on hunting trips. The height of the Ohuhu is adjustable from 6- to 9-inches. This is a great feature because it helps you adjust for your target. It actually has 5 different settings for the legs that adjust using return springs. The total weight is 327-grams and its dimensions are 7.4-inches by 3.4-inches by 2.5-inches. The dimensions and weight play to an easily transportable product. When looking for the best rifle bipod for you, make sure that it is easy to carry. Older models were known to be sturdy but hard to maneuver. The best things about the Ohuhu are that it’s sturdy and portable. It can attach easily to your weapon and the legs are adjustable autonomously—that means if you’re on uneven ground you easily can adjust for level. Each of the two legs has a rubber end for added stability. The second product we reviewed looking for the best rifle bipod was the UTG Tactical OP Bipod 8.3-inch to 12.7-inch. This was another choice with a lot of value to it. It is made of durable aluminum and the top platform is steel. This is a necessity with bipods because it makes them durable and sturdy but still light-weight for transport. The arms are foldable with spring tension. That makes it convenient if you need to extend them and folding them back up is no problem. Each arm has a posi-lock wheel and a button for quick retraction. Again-if you’re on the go with your hunting this plays well to being able to close up shop at one area and rush over to another for your game hunt. When shopping for this ype of products be sure that the weight is appropriate. This one definitely is. The UTG weighs just 13.3-ounces. It’s a little heavier than our Ohuhu but still well within the range of being portable and convenient. The dimensions for this one are 7.7-inches by 6.3-inches by 3.5-inches. 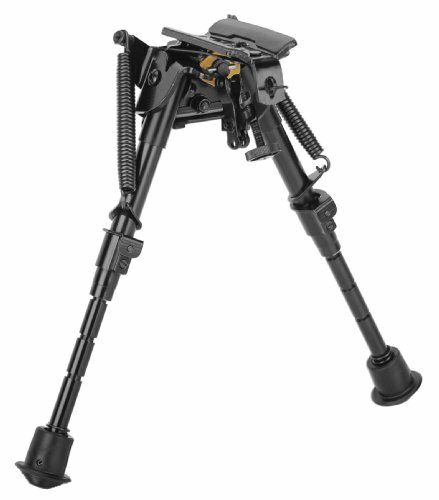 The Ledsniper Action choice was next on our list of reviews for the best rifle bipod. This one was a little different in construction. Rather than having the two legs jut out from just underneath the weapon, this one has a post and the legs extend out from that. It actually made it a little less sturdy, but still worth a look. First of all, this one is made from high-quality polymer with steel inserts in the legs. It weighs 8-ounces which makes it one of the lightest products we reviewed. We did question the construction because it’s about half as heavy as some of our other options, but the performance stood up well. For its price its cost-to-value is still high. Its dimensions are 2.3-inches by 6.9-inches by 2.7-inches. The Ledsniper also has a push-button control on the back of the assembly for the legs. This allows them to jut out quickly. To close them, you can just push them together. It wasn’t as convenient as the UTG Tactical, but it still got the job done. What makes this option unique is that its handle and the stand are one piece. Whether or not that makes it a true benefit is dependent on the user’s preference. It may be convenient to add value, or it may be difficult to get used to. We found it to be the former. The best rifle bipod is made for user convenience and this one is definitely in that category. In our search for the best rifle bipod we next looked at the Caldwell XLA pivot model. This one is made from aluminum, which makes it very lightweight. Like the first two reviews, this one has two legs jetting out with rubber feet for stability. They are notched for adjusting to different heights. This model comes in various heights: 6-inches to 9-inches, 9-inches to 13-inches, 13-inches to 23-inches, and 13.5-inches to 27-inches. We liked the option of getting the right height, however there may be more value in just having a single adjusting unit. Still, if you have a preferred height and know what it is, this may be a customizable option you like. The legs are spring-loaded which means they can be popped out immediately. They also are notched so you can easily adjust to the height you need. What we liked about this model the most was its ability to pivot. That allows the shooter to use it on unleveled ground. It says it works well up to 20-degrees, but it seems to be adjustable to more than that. It definitely will serve the user well on rough rugged terrain. The pivot is usable during adjustment to target also, which proved to be a welcomed convenience. The 6-inch to 9-inch Caldwell weighs 8.8 ounces and its dimensions are 11.9-inches by 5.8-inches by 2.4-inches. The 9-inch to 13-inch weighs 1-pound and its dimensions are 18.2-inches by 5.8-inches by 2.5-inches. The 13-inch to 23-inch weighs 1.3-pounds the 13.5-inch to 27-inch Caldwell weighs 1.5-pounds. Both of the larger models have the same dimensions as the 9-inch to 13-inch model. The UTG Shooters Swat is another model we reviewed when trying to find the best rifle bipod. This one is made from high-tech aluminum, which makes portability great. It weighs 12.8-ounces and its dimensions are 7.1-inches by 3.2-inches by 2.2-inches. What we liked about this model was its transportability. It seemed very sturdy for its size. 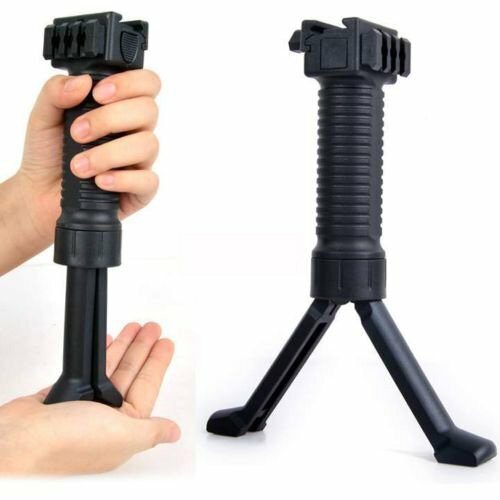 It has two foldable legs that are adjustable from 6.2-inches to 6.7-inches in height. It also has a swivel stud mount that allows for easy adjustment for precision shooting. 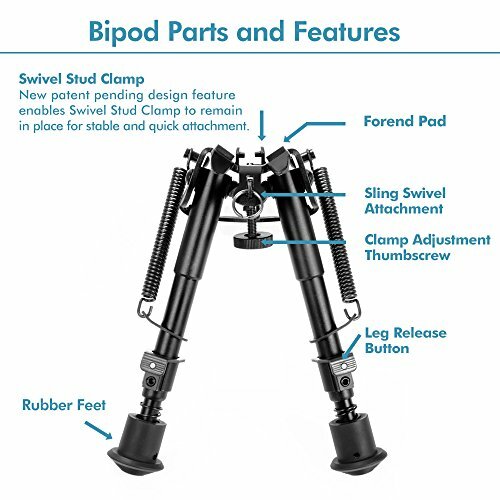 It comes with rubber feet and a unique posi-lock feature that helps to keep it from tipping—particularly helpful when you are on rough terrain and need a stable option. It also has a dual attachment feature—a weaver rail or an adapter with a sling mount. The best thing about the UTG Shooter’s Swat is that it is quiet. You won’t have a problem with scaring away game when hunting. You can easily take it down and move to a different location and set it up, completely stealth. When looking for the best rifle bipod you want to have something that is durable but also convenient to use. The UTG is definitely in both categories. We liked the Ohuhu but what wasn’t so great was its lack of a pivot or swivel top. If your target is a few feet to either side, you have to readjust the entire stand rather than just using a slight movement. The UTG Tactical OP, the Caldwell XLS and the UTG Shooter’s SWAT all have pivot action to them. This is a more than convenient feature. If you’re on the go with your game hunting, this is a must. 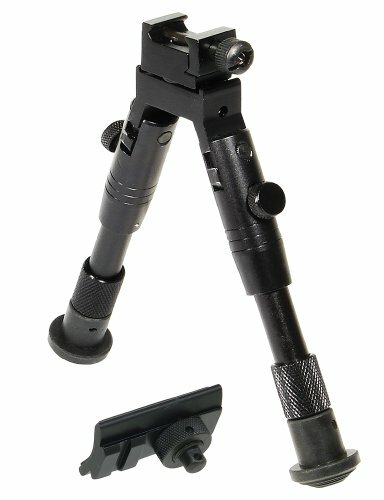 These three definitely made the cut of best rifle bipod thanks to added features like this one. The Ledsniper also lagged a bit for us. While it was unique in design because of its handle-bipod one-piece feature, we weren’t sure this would play well to its purpose. We get that it was added for “convenience”, but there’s reason why other models have their legs coming out from the base and not the handle. It seems to work better that way because it offers more stability. The Ledsniper just didn’t hold up. Our search for the best rifle bipod came down to the UTG Tactical OP, the Caldwell XLA and the UTG Shooter’s SWAT. Which option do we think is the best rifle bipod? After vetting these five options to find the one that we would choose, we decided that the Caldwell XLA Pivot Model Bipod came out on top. What we liked most about it was its lightweight design that that was durably made. We also liked the fact that the manufacturer chose to offer it in varying heights. There are four different ones to choose from. Although initially we thought that having one model that adjusted more would be beneficial, we decided that each product Caldwell offers has a good span of inches. That span allows each one to fit every need. If a hunter knows he or she needs a higher option for different terrain, or for their preference, they can easily order that one. We also liked the fact that this had a special pivot for uneven terrain. Overall it seemed like it was built with the best adjustable features we found. It also comes in both black and camo options. No this doesn’t help the performance, but it sure is a nice feature to be able to customize your two-legged support! There you have it. The one we would hand over our hard earned money for is the Caldwell XLA Pivot choice. What Do You Think - What Is The Best Rifle Bipod? Above we listed 5 options that we really like, but we realize there will be folks out there with differing opinions to ours. And that is fine! Everyone has their own likes, dislikes and requirements. So if you have some thoughts on which one you would choose, please share them in the comments section below. We would love to hear from you!